Communication and data collection from up to 24 ModbusRTU or ModbusTCP Meters from the PM-2000 or PM-3000 range of Smart Power Meters. Data Recording facility with real-time and historic graphs and statistics. Can be configured to automatically send data to a server system for further analysis. Build-in Web server for configuration and viewing of real-time and historic data using standard web browsers (includes Mobile version of the site). Seamless Integration with SCADA software or HMI Devices via Modbus RTU or TCP protocols. Built-in IF-THEN-ELSE Rule Engine that enables logical rule creation for power demand management. Scheduling facility for devices regulation and real-time alarm. Connects to a wide variety of extra I/O devices, such as the XW-Boards, M-7000 I/O modules and standard Modbus RTU/TCP Slave modules, enabling extra sensors/ parameters to be monitored to give more context to the energy data. Electricity consumption always plays an important role in factory operations. With the limited availability of the energy sources, countries all over the world all seek to enforce legal regulations in energy saving and carbon reduction. As the cost of energy is getting higher and higher, factories are paying increasing attention to energy and resource optimization, to enable effective usage of the energy, not only reduce the electricity cost but to also stabilize the power system to maintain the normal operation of the production line. 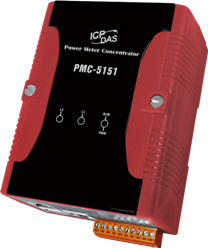 The PMC series is perfect for building a power monitoring system for factory applications. It will send out real-time notification when there is unusual electricity consumption, and will perform load shedding in real time when the forecast capacity is going to exceed the contract capacity to avoid penalties. And by working with SCADA software, it enables gathering and analysis of the power data to design best power policy to enhance the efficiency of power supply. In recent years, the rising of the global temperatures has resulted in the increase of the air-conditioning usage, causing an increase in electricity consumption, especially during the summer time. Therefore a power monitoring system that is able to efficiently analyse and execute power management (such as: demand monitoring or load shedding) becomes important to the building. A well-designed system will reduce the electricity bill, in addition, it also helps householders to pursue better behavior in energy saving to achieve more effective power usage. The power monitoring solution provided by the PMC & PM series devices is perfect for large-scale power monitoring of buildings. A PMC can be installed on each floor and connect to PM series smart meters via RS-485 or Ethernet to measure the power information of air conditioning, lighting , drainage or other electrical devices. The power information of the devices such as voltage, current and kilowatt information will be recorded in real-time and the data can be transmitted to a back-end control center. With SCADA software, it can perform data gathering and analysis of the power data. By collecting electricity data, analyzing electricity data, identifying the problems and correcting improper behaviors on the electricity usage, the efficiency of power usage can be enhanced and furthermore, ensure stable power supply and energy saving. Typically a campus usually involves large scale utility usages; the total electricity consumption of the buildings and devices is already considerably high. In recent years, due to the increasing use of the air conditioning and various devices, electricity bills can rise even higher, especially during the summer time when the frequent use of air conditioning significantly inflates the monthly charges. The school may also need to pay for the penalties when the electricity consumption exceeds the contract capacity. In order to effectively improve the efficiency of energy consumption on campus, a well-designed power monitoring & management system has become a priority. The PMC/PM series provide a total solution for campus electricity monitoring and management. The related personnel could set up alarms according to the contract they signed. When the electricity consumption is going to exceed the contract capacity, the PMC will send SMS or email notifications to related personnel for immediate actions. At the same time, it can perform load shedding to avoid penalties for exceeding contract capacity. By collecting and analyzing the power data of each device, the electricity consumption can be fully tracked and further more is able to establish effective policy to achieve energy saving and carbon reduction. The energy consumption associated with commercial buildings usually is considerably high. As the energy cost is getting more and more expensive, the demand for energy monitoring is also increasing. The solution provided by the PMC/PM series can be used to build a power management and monitoring system, specifically designed for a certain shopping center according to its requirements. By using the PMC and smart meters, it could measure and record the power data such as electricity consumption for devices, air conditioning, lighting or other electrical information of each store, and is able to send back the data to the management center for further analysis. Time-based air conditioning management: The air conditioning can be turn off or lower the electricity load during non-operating hours, while during the peak hours, the system can adjust the air conditioning to appropriate temperature. And when the electricity consumption is going to exceed the contract capacity, it could perform load shedding to avoid penalties. Based on the actual temperature during the day or night, the system can also adjust the air conditioning to appropriate temperature for energy saving. Time-based lighting control: Some lightings may be turn off whenever they are not needed during non-operating hours, while during the peak hours, the system can lower the electricity loading of the lighting when the electricity consumption is going to exceed the contract capacity to avoid penalties. The system could also schedule to turn on or off the lightings (including signage lightings or other devices) during day or night time as required. Monitoring & control of electricity consumption & demand: record the power information of the electrical devices (such as: air conditionings, engines, lightings or other devices). The real-time or historical data can be displayed or recorded for further analysis so that the user could establish policy for power management and perform load shedding whenever required to reduce the electricity bills and eliminate penalties due to exceeding the contract capacity. The DP-660 is a 65 watts,universal input switching mode power supply. It is a DIN-Rail Mounting PSU which has both 24V and 5V output.